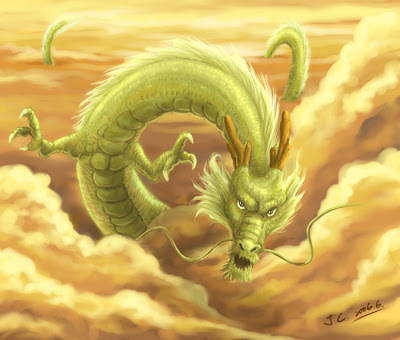 There are 4 magical animals in the Chinese mythology: dragon, phoenix, turtle, and kirin. 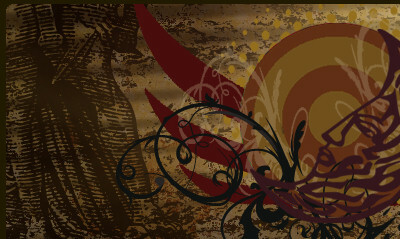 The dragon was for centuries an imperial symbol. When the Emperor died, it was said that he had raised to the Heaven over a dragon. Chinese legends tell that when a dragon is in the water, is covered with five colors. In China, the dragon has the power of changing its shape. They can turn into water, fire... even become invisible. The dragon is depicted like a snake with claws, sometimes with whale tail, deer horns, face of camel, ears of bull, tiger feet, eyes of lobster, and bat wings. Sometimes the dragon also has a pearl in its chin. This pearl has the power of granting wishes. In addition, it has influence over the moon's phases, the tides of the sea, the rain, the thunder, the lightning, birth, death and reincarnation. These pearls are sometimes spit by some dragons. Then, the pearl fills with light everything around it. For this reason, it is said that Chinese dragons glow in the dark. 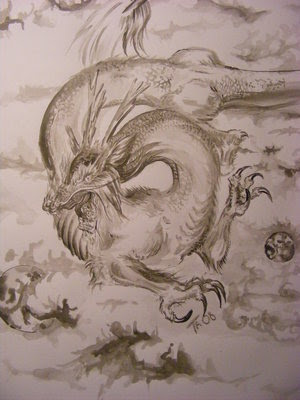 The dragon has a male nature (yang) and brings rain to the earth. There was a king in China called Wuyue, that was known as the Dragon King, because he did many projects of hydraulic engineering. 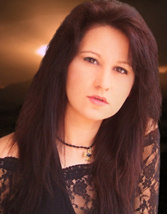 There are some dragons without horns called Jiao, that are female dragons. There are 4 major Dragon Kings. Each one represents one of the seas: the north, south, east and west sea. Many temples were consecrated to dragons, and in times of drought or flooding, they celebrated ceremonies to ask the dragons for water or the end of the rains. Number 9 is associated with dragons. Number 9 is like number 7 in the Western, a symbol of good luck. Tianlong, the dragon of the Heaven. Fucanglong, the dragon of the hidden treasures. 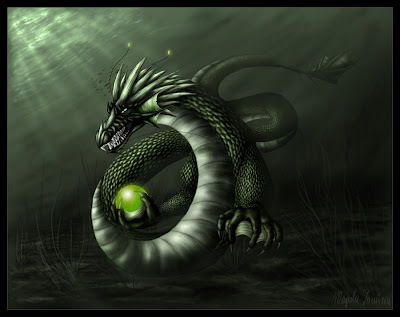 Panlong, the dragon that inhabits the waters. Huanglong, the yellow dragon that emerged from the waters of River Luo to teach the writing to humanity. Feilong, the dragon that walks over the clouds and the mist. 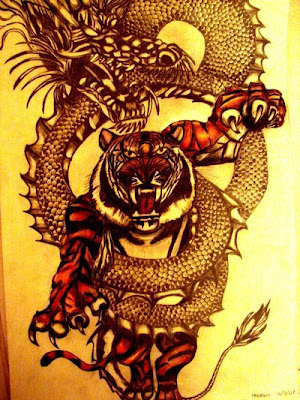 As a curiosity, it is said that the biggest enemy of Chinese dragons are the tigers. So it's not strange to see Chinese artworks in which fights between dragons and tigers are depicted. In martial arts, the so called dragon style is used to describe the power of mind and concentration on movements, while the tiger style describes the brute force. Images (in order): Chinese Dragon, by Pascargo; Chinese Dragon, by Zamkowa; Chinese Dragon, by J-C ; Tiger And Dragon, by Bungies.